Mike Fisher of the Nashville Predators was one of three nominees for the 2012 NHL Foundation Award for community service. John-Michael Lyles and Matt Moulson are the other two nominees. "It’s a great honor," Fisher explained. "That award, to me, means more than any other award. It something that a lot of other guys in the League do so many good things, so to be recognized with some of those guys is pretty cool." The Predators once again scored three goals on Mike Smith. Once again, it was not enough. Uncharacteristic defensive breakdowns proved costly in the Predators’ 5-3 loss tonight in Phoenix in Game Two. Shane Doan and Radim Vrbata led the way for the Coyotes, each tallying two points, as they took a 2-0 series lead with the win. The game started very similarly to Game One. The Coyotes carried the play for much of the first 10-15 minutes, scoring 8:32 into the first period when Keith Yandle found a wide open Antoine Vermette backdoor to go ahead 1-0. They continued to put the pressure on the Predators on a subsequent power play chance. The opening game between the Nashville Predators and Phoenix Coyotes lived up to everyone's expectations as two gritty teams, with tough defenses and solid goalies battled for sixty minutes with the inevitable overtime being required. Ray Whitney scored off of an offensive zone faceoff at 14:04 in to overtime to give the Coyotes their first ever second round playoff victory. The Predators had dominated all statistical categories for the third period and overtime until Whitney had the game winner. The Predators regulation time goals came from Brandon Yip, Andrei Kostitsyn, and Marty Erat while the Coyotes goals came from Radim Vrbata, Rusty Klesla and Mikkel Boedker. Pekka Rinne stopped 20 of 24 Coyote shots while Mike Smith had more work deflecting 39 of 42 Predator shots. Game two will be on Sunday at 9 p.m CDT in Glendale at Jobing.com Arena. In Goal: Nashville - Pekka Rinne (4-1-0, 1.81, .944) and Phoenix - Mike Smith (4-2-0, 1.81, .950). Scratches: Nashville - Jordin Tootoo, Brian McGrattan, Matt Halischuk, Colin Wilson, Jack Hillen, Ryan Ellis and Chet Pickard. Phoenix - Connor Murphy, David Schlemko, Paul Bissonnette, Chris Summers, Andy Miele, Michael Stone, Matt Watkins, Raffi Torres, Brett MacLean, Marc-Antoine Pouliot, Alexandre Bolduc, Brett Hextall, Ethan Werek, Maxim Goncharov, Jordan Szwarz, Justin Pogge, and Louis Domingue. After a mediocre shot at predicting the outcome in the first round of the NHL playoffs, we'll tee it up again and try to figure out who will make the conference finals in a couple of weeks. In the Western Conference, I correctly picked three of four series, including the Kings' upset of the President's Trophy toting Vancouver Canucks. My miss was not picking the Predators next opponent, the Phoenix Coyotes, to get past Chicago. The Eastern Conference was tough for everyone with three series going to game seven. I correctly picked the Rangers advancing and the Devils getting past Florida. I totally blew it on the Pens, who I thought would go to the finals, and even though I predicted seven games for the Bruins-Caps, I did not see Washington beating the defending Stanley Cup champs. NEW YORK (April 26, 2012) – The National Hockey League today announced the dates, starting times and television coverage for the 2012 Stanley Cup Playoff Conference Semifinals, which begin Friday, April 27, when the Phoenix Coyotes host the Nashville Predators. For the first time NBC Sports Group will have exclusive coverage of the Conference Semifinals in the U.S. CBC, TSN and RDS televise exclusive coverage throughout Canada. The National Hockey League announced today that Shea Weber of the Nashville Predators was one of three finalist for the 2012 Norris Trophy that will be given out at the NHL Awards Show at the Wynn Encore Hotel in Las Vegas on June 20. The James Norris Memorial Trophy, is awarded annually to the defenseman demonstrating "the greatest all-around ability in the position," and is selected by the Professional Hockey Writers’ Association. The other nominees are Zdeno Chara of Boston and Erik Karlsson of Ottawa. Last year, Weber finished a close second to Nicklas Lidstrom of Detroit who picked up his seventh career Norris Trophy. Lidstrom edged Shea Weber of the Nashville Predators 736-727 in the closest race for first place since 1996, when Chicago's Chris Chelios finished five points ahead of Boston's Ray Bourque, 408-403. With Lidstrom, Weber and third-place Zdeno Chara of the Boston Bruins receiving similar first-place vote totals (Lidstrom 35, Weber 32, Chara 33) and the trio separated by just 48 points, this marks the tightest three-way race for the Norris Trophy since its introduction in 1954. The Nashville Predators will begin their Western Conference semifinal series with the Phoenix Coyotes at the Jobing.com Arena in Glendale, Arizona on Friday night. Game two will be Sunday, also in Glendale. Starting times and television details are yet to be announced. Games three and four at Bridgestone Arena will be on Wednesday and Friday next week. The National Hockey League announced today that Pekka Rinne was one of three finalist for the 2012 Vezina Trophy that will be given out at the NHL Awards Show at the Wynn Encore Hotel in Las Vegas on June 20. The Vezina Trophy is voted upon by NHL General Managers and goes to the "goalkeeper adjudged to be the best at his position." The other nominees are Henrik Lundqvist of the New York Rangers and Jonathan Quick from the Los Angeles Kings. Last year, Rinne finished a close second to Tim Thomas of the Boston Bruins. He also finished fourth in the Hart Trophy balloting which was won by Anaheim's Corey Perry. Rinne actually finished ahead of Thomas in the Hart voting. October 13, 2011 - Coyotes 5, Predators 2 (Bridgestone Arena) - After starting the season 2-0 on the road, the Preds came home and looked flat in a game where little went their way. Paul Bissonnnette would not answer the call from Brian McGrattan in his first game as a Predator. Jason Labarbara got the win in goal. November 3, 2011 - Predators 3, Coyotes 0 (Jobing.com Arena) - Pekka Rinne signed a $49 million contract in the morning and then threw a 35 save shutout that night. That about says it all. December 6, 2011- Coyotes 3, Predators 2 (Bridgestone Arena) - The Predators gave up goals early (9 seconds in) and late (1:45 left) in a game that the Preds never led and the loss left the team and coach frustrated. The team's record was 12-11-4 at the end of the game. From that point forward, they went 36-15-4. March 12, 2012 - Predators 5, Coyotes 4, (SO) (Jobing.com Arena) - Andrei Kostitsyn scored the only goal in the shootout to give the even the season series with the Yotes. In what was billed as a battle of top goalies, both Rinne and Mike Smith gave up four goals on 35 shots. It comes as no surprise that Nashville Predators' General Manager David Poile was nominated as a finalist for the NHL GM of the Year. This is the third year that Poile has been nominated for the yet un-named trophy and he is yet to win it. Two seasons ago he lost to Phoenix GM Don Maloney who brought the Coyotes out or rubble and took them to the playoffs. Last season Vancouver GM Mike Gillis picked up the trophy. The Nashville Predators will face the Phoenix Coyotes in the second round of the Stanley Cup playoffs that will most likely begin on Friday or Saturday at the Jobing.com Arena in Glendale Arizona. It will be a match that will feature two of the NHL's hottest goalies as well as top strategic coaches. Pekka Rinne and Mike Smith were the stars of their opening round series and quality goaltending is expected to continue going forward. Preds coach Barry Trotz and Phoenix coach Dave Tippett are well known for getting the most out of their players which should set up an interesting chess match from behind the bench. The Predators were 2-2-0 against Phoenix this season with the road team winning all four contests. With confirmation that the NHL Stanley Cup Quarterfinals will extend until at least Thursday night with the Rangers and Senators set for a game seven showdown, it is a good time to look at building availability for the teams remaining in the hunt for moving to round two. The two series in the Western conference are set with St. Louis having home ice advantage over Los Angeles and Phoenix hosting Nashville. In the Eastern Conference, Washington and Boston will face their game seven final on Wednesday. Florida and New Jersey will either wrap up Tuesday or Thursday night. The earliest that the next round could start would be Friday night, most likely in the Western Conference, so we will use that as our starting point. One thing to keep in mind is that the NBA Playoff schedule will be set shortly, and affect building usage in New York, Boston, Philadelphia, and Los Angeles (two teams). There also remains the possibility that previously set events can be rescheduled. Thanks to Pete Weber for sending us the audio highlights from Friday night's clincher over Detroit. There are three clips, one of each of the Predators goals and another of the final moments ticking down as Nashville clinched a second round berth. Enjoy! First off, I need to differentiate that this post is different than our normal post game story. For the first time in four years, I attended a Predators game purely as a "fan" of the game. Thanks to the Nashville Predators and my ticket rep, Rebecca Swan, for accommodating my request to be seated in handicapped chair seating so that I attend what turned out to be one of the more memorable games in the team's history. In spite of being in my fourth year as a member of the unique, "Bloggers Row," I have maintained my season tickets having been an original "day one" season ticket holder as one of the folks that stepped up to help fulfill the 12,000 season ticket holder requirement in order for Nashville's NHL franchise to become a reality. Most of you probably do not realize that I underwent major abdominal surgery lest than two weeks ago where I received an eight inch cut to the belly in order to have three feet of intestine removed. All went well and the prognosis is good, but in the interim, I am in the midst of being severely limited in what I can physically do. Therefore, the accommodation by the team to seat me in the special seating in section 120 was the only way I would be able to safely and comfortably attend the game. Sitting in the press box and being focused on trying to find a unique angle for a game story really changes your perspective on the game. There is much more that needs to be done that simply enjoying the game. Even for road games on television, where you pour through statistics and look for key points of the game, it is still like work. So to have the rare opportunity to sit up close and enjoy the game was a real treat. The fact that the Predators beat the Detroit Red Wings 2-1 to close out the first round series 4-1, made it a top five game in Predators history. Going back to the first season in 1998-99 when Nashville won one out of the six contests between the teams, the Wings were the measuring stick that the Preds measured themselves with. Through the years, the teams became more evenly matched but the Predators lost playoff series with Detroit in 2004-05 and 2007-08 by 4-2 margins. The Predators never finished ahead of Detroit in the standings until this season and on Friday night, they put the exclamation point on that statement by winning their first playoff series over the Wings. It was fitting that the original Predator and Michigan native, David Legwand picked up the game winning goal. It was also apropos that the best forward that the franchise ever drafted, Alexander Radulov, returned to Smashville to score a goal and pick up an assist to contribute to the win. The other hero of the evening was the Smashville faithful who never sat down in the final period after Legwand gave the Predators a 2-1 lead just 13 seconds into the final period. Records were sat for the number of TV time out standing ovations and the level of noise that carried through the final period. 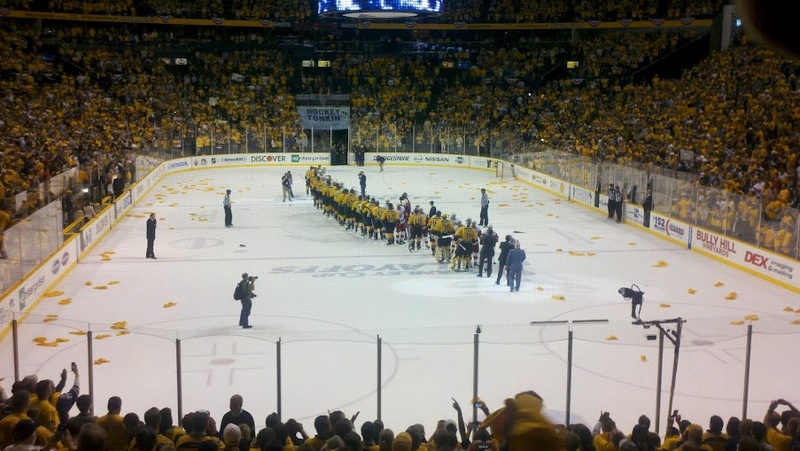 The fans were as much a part of the inspiration for the win as anything else in Bridgestone Arena. For one night, I was there, in the midst of the bedlam in the lower bowl and I was reminded of the passion and devotion of the Nashville crowd that had origins in the days of Tom Fitzgerald, Greg Johnson, and Cliff Ronning and has grown with the team that is now a serious Stanley Cup contender in 2012. The passion and devotion of the fans is the heart of Smashville. Hat's off to all who call themselves residents of the loudest arena in the NHL. All of the usual festivities that fans have come to expect will welcome fans back to the Bridgestone Arena tonight surrounding game five of the Western Conference Quarterfinal match between the Nashville Predators and Detroit Red Wings. All fans will receive gold out T-shirts and can attend the plaza part, both before and after the game. There are special deals for fans wanting to purchase new Predators sweaters, especially for anyone willing to trade in a Red Wings jersey. Predators and Wings series is a different kind of "nasty"
This year's Stanley Cup Playoffs have been marred by a record number of suspensions, nasty head shots, ugly fights, and repeated meltdowns of respect, especially in the Philadelphia-Pittsburgh Eastern Conference series. Heading into this year's opening round of the playoffs, the one series that would be expected to feature plenty of open ice skating with few penalties and a minimal amount of special team play would have been the Nashville Predators and Detroit Red Wings. During the regular season, the Predators were the least penalized team in the league with only 8.4 penalty minutes per game. Detroit was the second most disciplined team with an almost identical 8.5 minutes per game so there was little there to predict the parade of players to the penalty box that has resulted through four games. When looking at minor penalties, Detroit has been cited 22 times and the Predators have been charged on 24 occasions leading to plenty of power play time for both squads. Only Pittsburgh and Philadelphia have headed to the box more for two minute segments and that series has been a unique exception in playoff hockey. Only two majors have been accessed in the Preds-Wings series and that involved Shea Weber answering the call from Todd Bertuzzi as repayment for Weber's over-aggressive work on Henrik Zetterberg's helmet against the glass at the end of game one. That one bit of bad blood was dealt with in a gentlemanly way with the "one and done" fight and the animosity did not carry forward into further play. On Wednesday's off day, Predator Head Coach, Barry Trotz discussed the surprising rise in penalties. "We are the two least penalized teams in the National Hockey League so when each team could have five or six every game, that doesn't make any sense when you look at that." He opined about the sudden rise in penalties, "Both teams are going at the net harder. It's different than the other series. It's "nasty" in a grinding area. There's a lot of stuff that is done in really close quarters. There isn't any of that blatant stuff you see in some of the other series." "It's hard out there but there is probably a higher respect factor in our series than in some of the others so you don't see some of the very blatant things," Trotz continued. "You are getting more of those battles where a guy gets hooked up with another guy, or extends their arms for a hold, or trips a guy in the battles, so it is different and I don't think either coach expected that to be the case." Predators defenseman, Kevin Klein felt the officials were keeping the match under control. "It is definitely physical and they (officials) have been calling it a little tighter. Some of the things you may not have seen during the rest of the season, they've been calling. Detroit only took three penalties (in game four) so they were very disciplined." Klein offered his theory on the roughness of play in the other series, " It is the intensity of the playoffs. You have a lot of rivalries going on. You'd like to see the guys have a little more respect for each other. You want to play the game hard but within the rules as much as possible." "It's mostly split-second reactions and something that is going to happen every once and a while but you don't like to see it on the scale that we have in the first round." Parity is one of the things Trotz mentioned for the explosion of suspensions in the opening round of the playoffs. "There are eight teams in the Western Conference that believe that they can win the Stanley Cup so that is a fine line and the competitive juices are ramped up." The Predators were happy with Wednesday's day off. Trotz explained how tough the series had been on his players. "With the penalty kills that we've had to kill off, they are taxing on your top players. It taxes the Marty Erat's, the Fisher's, the Weber's, the Suter's, and the Klein's so they all get taxed pretty heavily along with Pekka in net, so getting a couple of days off will do us some good." Trotz indicated that the team has yet to play their best game and is looking for better play on Friday night. "You don't want to give up as many chances as we did. When you take seven penalties, they get so many chances on the power play, so we have to stay out of the box - that's discipline, and that's details." Further, in regards to game five, Trotz knows the level of commitment that will be needed. "This might be the hardest thing we have to do in terms of effort, detail, and commitment - to get the fourth win in the series." NASHVILLE PREDATORS HEAD COACH BARRY TROTZ IS TODAY'S GUEST ON "NHL HOUR WITH COMMISSIONER GARY BETTMAN"
NEW YORK (April 19, 2012) – Barry Trotz, head coach of the Nashville Predators, will be today's guest on NHL Hour With Commissioner Gary Bettman. The show, which encourages fans to call in with questions, airs Thursdays on NHL Network, NHL.com and on Sirius XM Radio at 6 p.m. ET. NHL Hour with Commissioner Gary Bettman broadcasts live on Thursdays from 6 p.m. to 7 p.m. ET on NHL Network, NHL.com and NHL Home Ice (channel 92 on XM and channel 207 on Sirius Premier). The show will re-air on Sirius XM Radio, with archived shows available for download via podcast on NHL.com. The show encourages fans to call in with questions. To submit questions to NHL Hour call 1-877-NHL-ON-XM (1-877-645-6696). While the Nashville Predators had an off day after Tuesday's 3-1 win over the Detroit Red Wings, Head Coach Barry Trotz and three players, David Legwand, Kevin Klein, and Gabriel Bourque held a conference call with the media. Here is the complete audio of the call. According to the the Saginaw Spirit team web site, Josh Shalla has signed a three year entry level contract with the Nashville Predators. Shalla recently completed his final season with the Spirit and is their all time leading goal scorer. He is st to join the Milwaukee Admirals as they open their first round playoff series with the Abbotsford Heat this Friday. Shalla was the Predators' fourth round pick in the 2011 NHL Entry Draft in Minnesota last summer. On a night when every statistical category (and some questionable officiating) went against the Nashville Predators, they managed to beat the Detroit Red Wings 3-1 to take a franchise first 3-1 series lead. Heading in to the final period, the game was scoreless and it appeared one goal could be the difference. The Preds struck first on a goal from Gabriel Bourque. The Wings quickly answered when Jiri Hudler tipped a puck into the net. Kevin Kline scored the game winner on a great feed from Marty Erat. With seconds ticking down, David Legwand put the icing on the cake with an unassisted goal. The hero of the game, as it seems to be every night, was Pekka Rinne who stopped 40 of 41 Detroit shots. Jimmy Howard took the loss giving up three goals on the Predators 17 shots. Detroit was fully in control of every aspect of the game but the Predator defense and goaltending gave Nashville a chance to steal the contest in the final period, as they deflected 73 of 74 Wings shots toward the net. The Predators returned home after the game and will have a chance to close out the series on Friday at Bridgestone Arena with a 7 p.m. puck drop. A few tickets remain available. In Goal: Pekka Rinne (2-1-0, 2.34, .928) versus Jimmy Howard (1-2-0, 2.71, .892). Scratches: Detroit - Jakub Kindl, Riley Sheaman, Jan Mursak, Chris Conner, Darren Helm, and Joey MacDonald. Nashville - Jordin Tootoo, Brian McGrattan, Colin Wilson, Jack Hillen, Hal Gill, Jack MacLellan, and Chet Pickard. The Predators sent Jordin Tootoo to the press box and started Matt Halischuk while the Wings continued with the same line-up as game three. The first period started just as the other three games have with plenty of hard play and the officials being quick to blow the whistle. The parade of penalties started at 7:38 when Roman Josi was called for interference on Jiri Hudler. The Wings managed a shot on the man-advantage. At 11:37, Todd Bertuzzi elbowed Nick Spaling. At 12:18, Alex Radulov ended the Preds' power play when he tripped Brad Stuart. The Preds got two shots on the man advantage. Detroit had one during the four on four and none on their power play. Josi was called for cross-checking Bertuzzi at 14:27 and then at 15:08, Pavel Datsyuk tripped Spaling. Detriot had one power play shot and Nashville had one during four on four play. The Preds only had ten pucks directed at the goal and play was marred by an abundance of stoppages, as indicated by 27 faceoffs. Uneven play continued as the period opened and in spite of keeping the puck in Detroit's zone better than the opening period, the Preds did not get their first shout until the 8:50 mark, when the Wings already had nine shots. The first penalty of the period came at 14:01 when Frankie Bouillon was called for hooking Bertuzzi. The Wings picked up a shot on the power play. The period ended with all the statistics heavily in favor of the Wings but the game remained scoreless. Rinne continued to be the sole savior for the Predators. The Predators were denied a goal due to a quick whistle at 1:28 when David Legwand threw the puck at Howard and banked it into the net but the on ice official declared that the play was dead. At 1:55, Bourque blazed a puck past Howard from the slot to give the Preds a 1-0 lead. The play started with Alexander Radulov throwing the puck toward the net from the corner and Justin Abdelkader tried to clear the puck and it went straight to Bourque. The Predators went short-handed at 2:44 when the officials ruled too many men on the ice. Andrei Kostitsyn served the penalty. The Wings took advantage at 3:14 when Kronwall launched one from the blue line with Hudler tipping the puck into the net while blocking Rinne's view. Kyle Quincy also assisted. The Preds took a 2-1 lead at when Marty Erat drove the length of the ice and was pushed wide by three Red Wings but he had the presence of mind to cent the puck to an oncoming Klein who blew the puck into the empty side of the net. The Wings got a quick chance to come back at 7:15 when Andrei Kostitsyn was called for interference on Stuart. Nashville got two shots and Detroit had one on their man-advantage. Klein and Abdelkader skirmished at 9:59 after Abdelkader was shoving Rinne but no penalties were accessed. The Predators were given another penalty at 13:41 when Matt Haliscuk interfered with Henrik Zetterberg. Detroit had one shot but the Predator penalty kill held firm. With 1:31 remaining, Detroit called a time out and pulled the goalie Howard. With 55.8 seconds left, Zetterberg high-sticked Shea Weber. On the Preds power play, with Howard back in net, Legwand sealed the win for the Predators with 38.9 seconds left when he skated from behind the net to put it past Howard. The Milwaukee Admirals beat the Charlotte Checkers 6-1 on Sunday afternoon and secured their tenth straight postseason berth and will play Abbotsford at home at the Bradley Center beginning on Friday night. The Admirals are the American Hockey League affiliate of the Nashville Predators and have had a tremendously successful partnership with "the road to Nashville going through Milwaukee" for almost every Predator prospect. The Nashville Predators took an early lead and never relinquished it as they held on to beat the Detroit Red Wings 3-2 at Joe Louis Arena on national television on Sunday afternoon. Detroit fired 34 pucks at the net in the final period and were credited with 19 shots officially and they maintained puck possession for most of the third period. Pekka Rinne was at his best, stopping 41 of 43 Detroit shots. Jimmy Howard played well in the loss, allowing three goals on 22 Nashville shots. 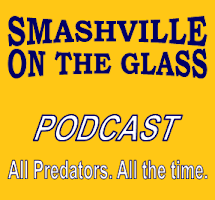 The Predators scoring came from Shea Weber, Kevin Klein, and Sergei Kostitsyn. Pavel Datsyuk and Henrik Zetterberg added goals for Detroit. Klein should also be credited for the save of the game when he dove in front of a shot from Cory Emmerton on the empty side of the net early in the third period that would have tied the game. The win was the first at Joe Louis Arena for the Predators in the postseason. Through three games, the series could not be any closer with each game having a 3-2 final score and going down to the final horn in each one. The Predators lead the series 2-1. Game four will be Tuesday night in Detroit at 6:30. There is no shortage of locations to gather together with like-minded hockey fans for Sunday's rare morning puck drop for game three in the Predators-Red Wings opening round playoff series being broadcast from Joe Louis Arena in Detroit. O'Charley's locations are always the official location for games, but plenty have been added so that there is a watch party convenient for almost everyone in the Nashville area. The contest will be broadcast nationwide via NBC at 11 a.m. CDT and will be followed by Pittsburgh traveling to Philadelphia for game three in their series. In a dramatic game of solid team defense and excellent goaltending by Jimmy Howard, the Detroit Red Wings evened their first round series with the Nashville Predators in a solid 3-2 win at Bridgestone Arena. Howard was the story of the game, stopping 24 of 26 Nashville shots and allowing minimal second chances as he played a career game in shutting down the Predators, including holding the Predators' league best power play to no goals on six opportunities. Detroit's goals came from Ian White, Cory Emmerton, and Johan Franzen. The Predators' goals came from Andrei Kostitsyn and Shea Weber, who's goal with less than five minutes to play gave the Predators a chance to win in the closing minutes. Pekka Rinne was not sharp early but was tough down the stretch, stopping 14 of 17 Detroit shots in the loss. The series is all even and will move to Detroit on Sunday where game three will be on NBC in a national broadcast at 11 a.m. CDT. Tonight's game between the Nashville Predators and Detroit Red Wings starts 30 minutes earlier than usual, at 6:30 p.m. CDT. The game sponsor will be the Tennessee Lottery and the team is gambling that the Preds will fare better on gold T-shirt night during last years's playoffs. Bridgestone Arena doors will open at 4:30pm CT. The game is Game B in your ticket books and is already sold out so come in your gold and help keep the red out! The traditional plaza party, resented by AT&T, begins at 3:30 and will feature live music, video screen, mechanical bull rides, gaming trailer, smash car, ace painting, and much more! The game will be on SportSouth and 1025 The Game as the Predators will try to add to their 1-0 series lead over the Detroit Red Wings in the 2012 Stanley Cup Quarterfinals! For more information, visit the Preds Playoff Central here. For the second time in three weeks, the Nashville Predators have designated Friday as Predators Pride day in Middle Tennessee to get fans prepared for game two with Detroit that begin at the special start time of 6:30 p.m. CDT. With the AHL playoff race hearing back up this weekend in Milwaukee, Chet Pickard and Jeremy Smith swapped spots with Smith returning to his number one role in Milwaukee and Pickard returning to practice in Nashville. Nashville, Tenn. (April 12, 2012) – Nashville Predators President of Hockey Operations/General Manager David Poile announced today that the club has reassigned goaltender Jeremy Smith to Milwaukee (AHL) and recalled goaltender Chet Pickard from the Admirals. Pickard, 22 (11/29/89), posted a 14-12-2 record with a 3.12 goals-against average, a .890 save percentage and a shutout with the ECHL’s Cincinnati Cyclones in 2011-12. This is the second postseason Nashville's second choice, 18th overall (first round), in 2008 Entry Draft has been with the club – he was recalled on April 27, 2011 and stayed with the team through its Western Conference Semifinals series vs. Vancouver. The Predators and Red Wings Western Conference Quarterfinal Game Two, brought to you by the Tennessee Lottery, will broadcast from Bridgestone Arena at a special start time of 6:30 p.m. on 102.5 FM The Game and SportSouth (Comcast 1676 HD, 26 SD) tomorrow. The playoff plaza party will kick off at 3:30 p.m. on the Bridgestone Arena plaza with live music, games, the smash car and much more. Shea Weber was filed $2500 for his retaliatory hit to the head of Detroit's Henrik Zetterberg at the end of game one of the Western Conference first round match. In another incident, Detroit's Darren Helm underwent successful surgery Wednesday night to repair lacerated tendons in his right forearm and will miss the rest of the playoffs. He suffered the injury with just over eight minutes remaining in the first period. NEW YORK -- Nashville Predators defenseman Shea Weber has been fined $2,500, the maximum allowed under the Collective Bargaining Agreement, for delivering a blow to the head of Detroit forward Henrik Zetterberg in Game 1 of the teams' Western Conference Quarterfinal series in Nashville on Wednesday, April 11, the National Hockey League's Department of Player Safety announced today. The incident occurred at 20:00 of the third period. Weber was assessed a minor penalty for roughing. "This was a reckless and reactionary play on which Weber threw a glancing punch and then shoved Zetterberg's head into the glass," said NHL Senior Vice President of Player Safety and Hockey Operations Brendan Shanahan. "As is customary whenever Supplemental Discipline is being considered, we contacted Detroit following the game and were informed that Zetterberg did not suffer an apparent injury and should be in the lineup for Game 2. "This play and the fine that addressed it will be significant factors in assessing any incidents involving Shea Weber throughout the remainder of the playoffs." The fine money goes to the Players' Emergency Assistance Fund. The first night of the Stanley Cup Playoffs hadn’t yet concluded when Predators goaltender Pekka Rinne made an acrobatic stop that will surely be a nominee for the top save of the postseason when it’s all said and done. With the Predators leading 2-1 at the beginning of the third period, Red Wings forward Henrik Zetterberg had the puck on his stick with essentially the entire net open. Zetterberg’s wrist shot, however, was stoned by a sprawling Rinne. It was the second time in less than two weeks that Rinne robbed Zetterberg of a goal. Rinne’s stop on Zetterberg kept the Red Wings from tying the game, and was a big moment in the Predators’ 3-2 Game One victory. “[It was] just desperation,” Rinne said of his big save after the win. “They made kind of a criss-cross kind of pass. First to [Pavel] Datsyuk and [he] found Zetterberg and I was able to reach my hand. Before forward Gabriel Bourque scored to give the Predators a 3-1 lead midway through the third, Rinne made other big plays to hold onto the one-goal lead. There were a few tense moments late in the game, as there always are against Detroit. Tomas Holmstrom scored with 3:07 remaining in the third to bring the Red Wings back within one goal. Rinne, who had a stem machine hooked up to his legs after the game, definitely earned his paycheck tonight. He made 35 saves in the victory, 30 of which came in the final two periods when the Predators were out-shot 32-13. The Predators squandered six power play opportunities and played on their heels a bit for the final two periods, but it was important to start the series on a good note. Holding a 1-0 series lead, the Predators will host Detroit in Game Two on Friday night. Many sports fans in the rolling hills of Middle Tennessee that have long traditions of football season running 365 days a year, only have casual interest in the Nashville Predators until playoff time comes around. This year, the late arrivals may have to have a longer attention span than in past seasons. Predators GM David Poile has put together a squad that has the potential to go deep in the playoffs, potentially into June and the Stanley Cup finals. In spite of making the playoffs six of the last seven seasons, few folks in the mainstream hockey media paid much attention to the Predators prior to last year’s series with the Vancouver Canucks when Nashville made it to the second round of the NHL playoffs for the first time. From the first year of play in 1998, the Predators have always been a workman-like team that exceeded expectations. Recently, the criticism was that the team lacked a big scoring forward. In mid March, the best player in the world, not in the NHL, returned to his original team after four years as the KHL’s best player. When Alexander Radulov returned to Nashville to fulfill the final year of his entry-level contract he became the most dynamic player to have ever worn the “Predator gold”. After only nine games in Nashville, Radulov has to be considered a top-ten NHL forward as much for he play away from the puck as when he has the puck on his stick. The 25 year-old is a much-improved player than the one that left abruptly in 2007. There were questions as to how Radulov would be accepted back to the Predators after his departure four years ago, but they were answered quickly when teammates and fans saw him in action and he has quickly become a fan favorite as all has been forgiven. There has been fierce competition for playing time in recent weeks, with the Predators carrying 27 players on the roster and the ones that are producing are getting the minutes. The team has been built from the goal out and 6’5” Pekka Rinne, who leads the NHL in wins, is the anchor. Anders Lindback is the other half of Nashville’s “13 feet of goalie” checking in at 6”6”. The top defensive pair is Norris Trophy candidates, Shea Weber and Ryan Suter. The other four d-men slots are mostly filled with combinations of Kevin Klein, rookie Roman Josi, Hal Gill, and Frankie Bouillon. Waiting for opportunities are Jack Hillen and rookie Ryan Ellis, who won every award available during his four years with the Windsor Spitfires. The Predators have long been known for a lack of scoring punch, with plenty of 2-1 games peppering the season’s results. This year, the Preds were fourth in the West in scoring, and after years of struggles on the man-advantage are now ranked number one in the NHL in power play conversion. The Predators score by committee and only have two twenty-goal scorers, but do boast of eleven players with ten or more goals for the year. Nashville’s top line is centered by Mike Fisher, with Sergei Kostitsyn, and Marty Erat on the wings. The second line is still a work in progress as Radulov has been added to the line centered by the original Predator draft pick, David Legwand. Patric Hornqvist and Andrei Kostitsyn are the other candidates. From that point on the competition is fierce with a wide variety of forwards, each with a different skill set, trying to make the lineup each game. Ex-Boston University player, and Hobey Baker finalist, Colin Wilson has found his previously lacking consistency this season and is close to becoming the player that was expected. Rookie Craig Smith who made the jump from the University of Wisconsin has struggled with the number of games played, but has shown flashes of brilliance at times. The one player that exemplifies “Predator hockey” the best and who has become one of Trotz’s favorites, is 21 year old, Gabriel Bourque, who hails from Rimouski, Quebec. Trotz has repeatedly said that he improves any line on which he plays. Masterton Trophy nominee, Jordin Tootoo is a player that is known for being a shift disturber but has actually gotten away from that role in the last couple of seasons. Toots is a much more well-rounded player than folks outside the Nashville area realize and is greeted by hundreds of “Too-Too whistles” every time he steps on the ice. Matt Halischuk, Nick Spaling, and Brandon Yip all have similar roles, playing solid two-way, gritty hockey in the trenches and on the boards. Paul Gaustad was acquired at the trade deadline from Buffalo as a face-off and penalty kill specialist and is guaranteed a start every night. For toughness, Nashville brought in one of the better pugilists in the game in Brian McGrattan, who only plays when trouble is imminent. With all the late season additions, especially with the post-deadline pickup of Radulov, most pundits see Nashville with a good chance of making the Western Conference finals and possibly even having a sniff at the Cup in the final series in June. It all begins on tonight at the Bridgestone Arena when the Predators’ measuring stick, the Detroit Red Wings comes to town for what should be a long, hard-fought series between the best team in the NHL over the last 20 years and a hungry, youthful Nashville team. It is always interesting to take a look at what the bookies who never lose have to say about who they feel will be the winners and losers in the upcoming NHL Stanley Cup Playoffs. Bear in mind, that the goal of the bookmakers is to set a number where there should be a near equal amount of betters on each side of the action so it's not so much an exact science as it is a projection of how to split the money of the masses on each side of the wager. We went to Bodava.lv to see what the current odds were and found few surprises. The Pens and Canucks are favored to face off in the finals, with Pittsburgh having a slight edge. Some of the individual first round series have some fairly large numbers with the Rangers and Bruins being the most heavily favored. The 20 players that make the score card for the Nashville Predators for the puck drop on Wednesday night at the Bridgestone will look far different than the ones on opening night of the 2011-2012 season. In the preseason, the one thing that Predators' GM David Poile repeatedly stressed was that the Predators would be much better in the season's second half than in the first half and that the team was ready to spend the money that it took to do it. It actually started sooner than the midpoint. After 27 games, the Predators were 12-11-4 and looked fairly average. Starting with the comeback victory in Columbus on December 8, the Preds went 36-15-4. Poile's reshaping of the Preds' lineup was drastic, ongoing, and highly successful. On opening night Teemu Laakso, Blake Geoffrion, Jon Blum, Cal O'Reilly, Niclas Bergfors, Zach Stortini, Mattias Ekholm, and Jerred Smithson were all on the 23 man active roster. Today, Laakso, Blum, and Stortini are in Milwaukee, Ekholm is in Europe, and the rest are out of the organization. In October, no one could have imagined that the season would end with Hal Gill, Paul Gaustad, Andrei Kostitsyn, Brandon Yip, and the crown jewel of pick-ups, Alexander Radulov, playing key rolls with the Preds. Rookies that broke through to play key roles during the second half of the season included Roman Josi, Ryan Ellis, and Gabriel Bourque, the player that Barry Trotz says "makes any line better." Forty different players have been on the Predators active roster at some point during the season. Some never touched the ice but still were in Smashville. That list would include college signee, Jack MacLellan, and back-up goalies, Jeremy Smith, and Chet Pickard. Now as the playoffs loom, the Predators boast an active roster of 28 players, that includes three goalies, eight defensemen, and 17 forwards. All except for rookies MacLellan and Smith are NHL ready players competing for playing time every night. With the late season acquisitions, several players that have been key to the team's past success have found themselves in the press box as often as not. Jordin Tootoo, Colin Wilson, Matt Halischuk, Craig Smith, Jack Hillen, and Ryan Ellis have all been in and out of the twenty players that dress in the last month. Trotz discussed his plan for the line-up in the playoffs. "I think we will have more of a set line-up. We have tried to keep everybody in the fold involved and tried to sort our what was the best grouping of players. Now I think we will go to pretty much of a set line-up." "Guys play themselves in and out of the line-up. Just like last night (in Colorado on Saturday), it was sort of a dress rehearsal for some guys." Trotz continued, "Guys that hadn't been in there in a while and played very well they may have made a real good statement so they may not start the series but they have moved up the ladder." "Every day you are evaluated and we just have to put the right pieces in. Everybody brings a specific skill set to the group and we're going to need all kinds of skill sets to make it work." Trotz then made an interesting analogy to the line-up discussion, "They say it's like be a contractor when you build a house. You need a little bit of everything and all kinds of trades people to make your house beautiful and be efficient. So we'll need all those type of contractors." In summary, Poile has amassed the best group of high-end talent in franchise history and the Preds are carrying an abundance of depth players that Trotz has ready to play a high energy game as needed during the playoffs. This should be the best opportunity for the Nashville Predators to have a legitimate shot at a run for the Stanley Cup that the citizens of Smashville have ever seen. The time has come to go out on a limb and expose myself to the world and show how much I don't know by throwing out some mad guesses as to what will happen in the first round of this years NHL playoffs. Taking a quick look back to preseason predictions, I picked seven out of eight playoff teams in the Western Conference, missing only the Phoenix Coyotes. I had the Anaheim Ducks returning to the playoffs, thinking that Dave Tippett had run out of rabbits in his hat and that the tumultuous situation in the desert would finally wear down the Coyotes. My picks in the East were a disaster. I did have the top five finishers, but in the wrong order, and like most others, I had Florida and Ottawa relegated to the bottom of the Conference. I also had the Devils just missing in ninth place. My choices that did not make the playoffs were Tampa, Buffalo, and Montreal. With all that being said, it is time to move on to the first round picks. Goalie Jeremy Smith was recalled from Milwaukee today by the Nashville Predators as a precautionary measure after back-up goalie Anders Lindback received an injury in the final game of the season in Colorado. The injury occurred early in the final period when several players fell on Lindback in a scramble around around the net. Predators' coach Barry Trotz termed the injury "minor" and said that he expected Lindback to back-up starter Pekka Rinne in the opening game of the playoffs against Detroit on Wednesday night at Bridgestone Arena.. The Nashville Predators announced the television plans as well as the promotional night for their first round games against the Detroit Red Wings. The complete first round schedule for the Nashville Predators and Detroit Red Wings was released today in a special one-hour show on the NHL Network. In spite of having no bearing on the final Western Conference standings, the Nashville Predators played like true professionals in beating the Colorado Avalanche 6-1 at the Pepsi Center on Saturday night in Denver. Colorado mounted a good effort, putting a season high 45 shots on the Predators, but the game appeared to turn on a shot by Kevin Klein that was deflected into the net by Patrick Hornqvist with less than a second remaining in the opening period to give Nashville a 3-1 lead. After that point, the Preds received three unanswered goals from Roman Josi, Brandon Yip, and Matt Halischuk. The Preds first two goals came from Craig Smith and the game winner from David Legwand. Colorado's lone goal was from Matt Duchene. Smith also had a pair of assists for a three point night and two from Kevin Klein which gave him a career high 21 points..
Anders Lindback picked up his fifth win in spite of leaving the game early in the third period with an injury. Prior to leaving, Lindback stopped 34 of 35 Colorado shops. Pekka Rinne stopped all ten shots that he faced. J.S.Giguere took the beating for the Avalanche, going the distance, giving up six goals on 29 Predator shots. The Predators returned home to Nashville after the game and will have Sunday off before returning to practice on Monday. The full first round schedule will be announced at noon CDT on Sunday so the team will know when the opening game against Detroit at Bridgestone Arena will be held. The Nashville Predators secured the fourth seed and home ice advantage in the opening round of the NHL Playoffs when Chicago beat Detroit 3-2 in a shootout at Joe Louis Arena on Saturday Afternoon. The opening game will most likely will be on Wednesday or Thursday night at Bridgestone Arena. The Predators will face the Detroit Red Wings in the playoffs for the third time in franchise history. The Predators lost to Detroit in six games in their first playoff appearance in 2004 and then lost in six games again in 2008. Nashville's final game of the season in Colorado tonight at 8 p.m. has no bearing on the standings and may feature several top players being rested. Here are today's updated facts and figures from NHL Media Services on the playoff races in the NHL. It all comes down to one day left in the season with all 30 NHL teams in action. In the East, the top eight teams are known and five teams know where they will finish but opponents are still up in the air for all but Philadelphia and Pittsburgh. In the West, the eight teams are also known but the final seedings are yet to be decided. Previously we took a look at Western Conference building availability during the NHL first round playoff time frame. We now give the Eastern Conference venues the same treatment. There are several more teams in the East that share facilities with NBA franchises which makes scheduling a bit trickier. Fortunately, none have two NBA tenants like the L.a. Kings have to deal with at the Staples Center. The only match that is already set is Pittsburgh and Philadelphia. You could easily project that the Pens will host the first two games on Wednesday and Friday before they move into the more used Wells Fargo Arena for games three and four. It's hard to imagine that there won't be a weekend game on the NBC Network. The Rangers and Bruins are the only teams with home ice secured and both seem to have plenty of dates for the home slate at the proper time. Make the jump for all of the building schedules from the Eastern Conference playoff teams, bearing in mind that the can be rescheduled events.